The Annises(*) claim to have been in North America for four hundred years. The first bearer seems to have come from the east coast of England or Scotland, and was probably a Norseman, a suggestion which is borne out by the succession of capes and promontories on that rocky coast named or ending in the syllable “Ness”. The first Annis was “AnNess”, which by a free translation of Scandinavian indicates him to have been marked by a characteristic still common in the family, namely, “big nose”. The first member of the family to have been noted seems to have been a member of that band of soldiers which under Strongbow, in the reign of James the First, drove the O’Neill from the north of Ireland. 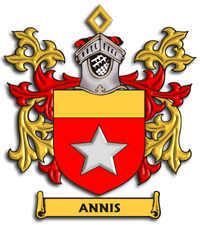 And in the resulting settlement, Curmac, or Charles Annis was born about the year 1638 in the Town of Enniskillin. But the times were troubled. Cromwell overran Ireland in the cause of Protestantism, and with the downfall of the Commonwealth and the license, which arose, with the reign of the second Charles, Curmac, whether for reasons of safety or orthodoxy, found himself aboard ship bound for New England. Ref. : Annis Annals. For more history, please visit the Annis Annals website maintained by my 6th cousin, Michael James Annis.